Linda Burton posting from Tallahassee, Florida – The big story near the end of November every year is the story of a feast. It’s called the “First Thanksgiving in America” and depicts Pilgrims and Indians gathered around a table, celebrating a bountiful harvest. The focus, often presented by kids in tall hats on a school-play stage, is gratitude and cooperation. The Pilgrims came in peace, to settle in a new country, but didn’t know diddly squat about surviving in their new surroundings. The equally peaceful Indians gave them a hand, showing them how to drop a dollop of fish into the hole before planting the seeds of native corn and squash, provided by said Indians. The fish was good fertilizer; the crops grew bounteously; and harvest time was a time for feasting together, in peace. It’s a great story, or legend; it’s the way we like to think of the settling of what became the United States. 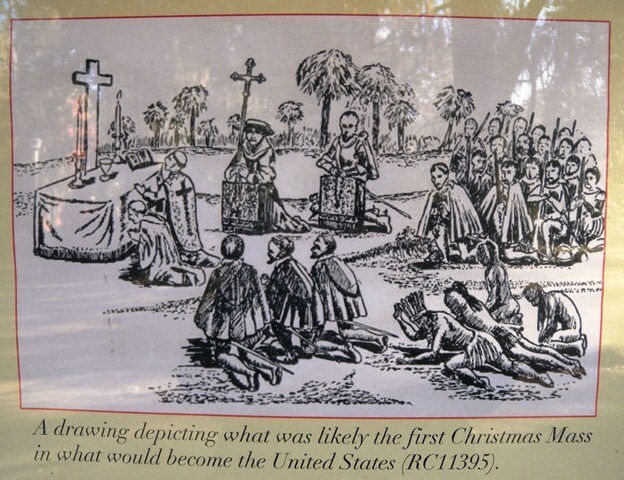 Less fuss is made over the “First Christmas in America” however, at least, what likely was the first Christmas; it happened within a mile of Florida’s state capitol building in present-day Tallahassee. 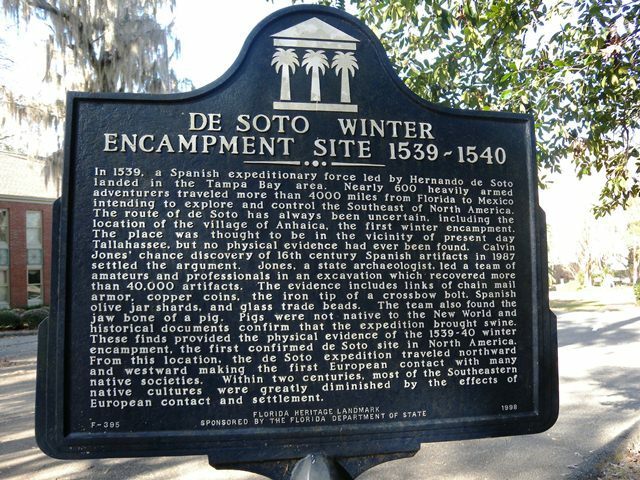 Go back to 1539, and imagine Spaniard Hernando de Soto, and his winter encampment there. It is probable that a Christmas Mass was held. But don’t conjure up images of a joyful celebration with the neighboring Apalachee Indians, for de Soto did not come in peace. 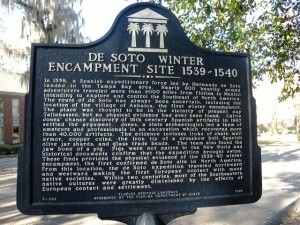 Hernando de Soto is a controversial figure in American history. Was he a trailblazing explorer, or an overzealous madman? In his native Spain he is regarded by many as a romantic hero; in Central and South America he is considered by many to be a monster, a view shared, perhaps, by southeastern native tribes in North America. I won’t go into his South American conquests here, or his appointment by the King of Spain as Governor of Cuba; let’s start with May 1539, when, traveling from Cuba, he landed in Tampa Bay with an army of soldiers, craftsmen and clergy. 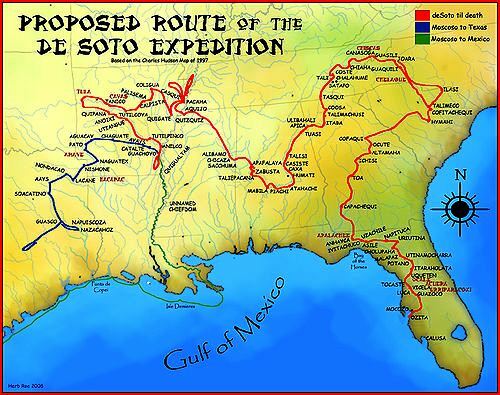 They were met with fierce resistance by indigenous people, yet de Soto spent the next four years searching for “gold and glory” in a four-thousand-mile journey of warfare, disease, and discovery through what is now the southeastern United States. His trail extended from Florida into what became Georgia, the Carolinas, Tennessee, Alabama, Mississippi, Louisiana and Arkansas. He died of a fever in Arkansas; it is believed he was buried in the Mississippi River. Four significant accounts exist of de Soto’s journey, three of them penned by participants. From descriptions of land and people encountered, scholars long ago determined de Soto’s general route through the southeast. In recent years, archaeological evidence has helped to pinpoint places which the expedition definitely, or probably, passed by. 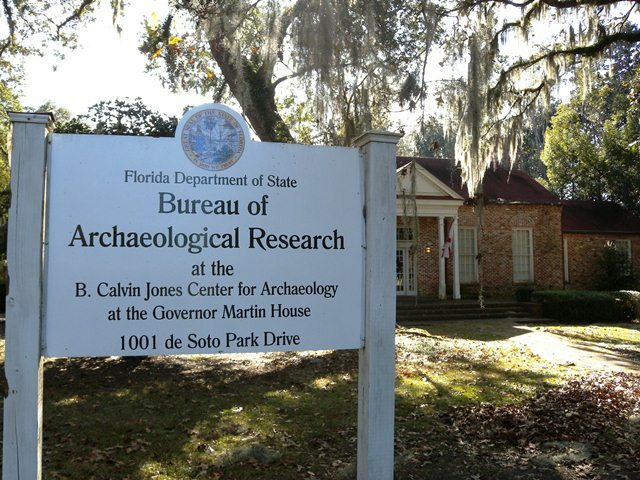 Two Florida sites have been documented as definitively associated with de Soto’s expedition – one is a few miles north of Ocala; the other is the Winter Encampment in Tallahassee, discovered by archaeologist B Calvin Jones in 1987. 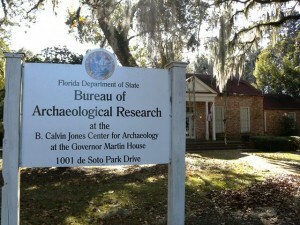 In this small state park just off Lafayette on DeSoto Park Drive in Tallahassee, interpretive markers are tucked among moss-draped live oaks near another historic site, the Governor John Martin House, which now serves as headquarters for the Florida Bureau of Archaeological Research. 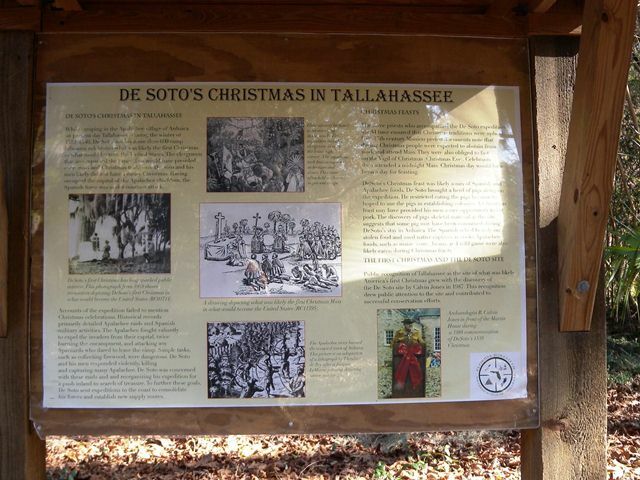 While camping in the Apalachee village of Anhaica in present day Tallahassee during the winter of 1539-1540, De Soto and his more than 600 camp followers celebrated what was likely the first Christmas in what would become the United States. The clergymen that accompanied the expedition would have presided over mass and Christmas traditions. De Soto and his men likely did not have a merry Christmas. 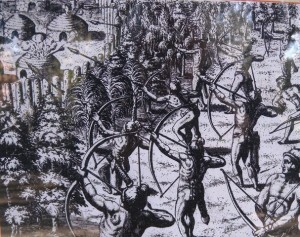 Having occupied the capital of the Apalachee chiefdom, the Spanish force was under constant attack. 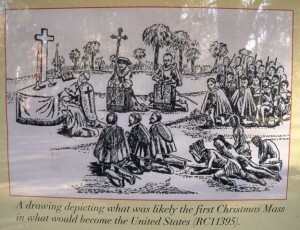 The three priests who accompanied the De Soto expedition would have ensured that Christmas traditions were upheld. Late 17th century Mission period documents note that during Christmas people were expected to abstain from work and attend Mass. They were also obliged to fast on the Vigil of Christmas (Christmas Eve). Celebrants then attended a midnight Mass. Christmas day would have been a day for feasting. De Soto’s Christmas feast was likely a mix of Spanish and Apalachee foods. De Soto brought a herd of pigs along on the expedition. He restricted eating the pigs because he hoped to use the pigs in establishing colonies. A Christmas feast may have provided his men a rare opportunity to eat pork. The discovery of pigs skeletal material at the site suggests that some pigs may have been consumed during De Soto’s stay in Anhaica. The Spaniards relied heavily on stolen food and used native captives as cooks. Apalachee foods such as maize corn, beans, and wild game were also likely eaten during Christmas feasts. In addition to consuming the supplies of food they found at Anhaica, de Soto’s soldiers raided other villages in the area, taking food and enslaving any inhabitants they could catch. 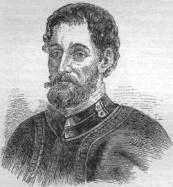 The Apalachee responded by ambushing small detachments and by setting fire to the winter encampment. It was partially destroyed, but de Soto and his men remained. The Apalachee chief commanded a sizable force of warriors feared by their neighbors. Every day, warriors harassed and attacked the Spanish occupying their village. 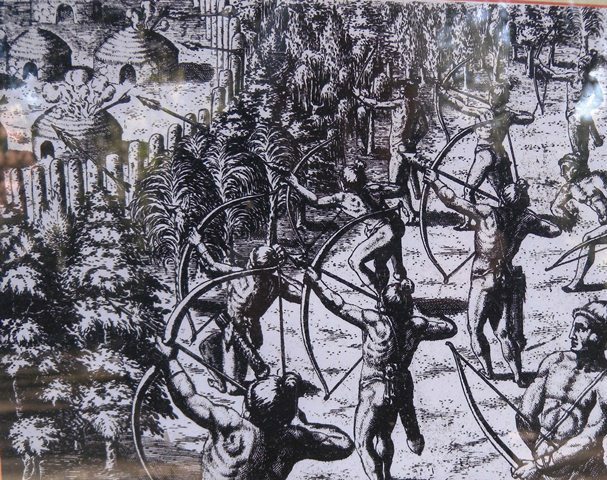 They burned huts and crops, attacked anyone who strayed from camp, and shot arrows into the village.